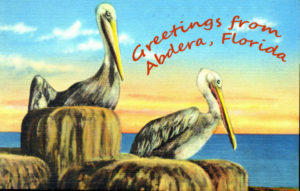 (The following is a work a fiction, part of an on-going series of vignettes about the made-up town of Abdera, Florida.) 002/??? In addition to buying and selling real estate, William Bloodorange was one of Florida’s most successful optometrists, and an early innovator in franchising vision health stores. In the boom years after the second world war, Dr, Bloodorange built The Independent Hotel between the Tamiami Trail and the Gulf of Mexico. It was one of the grandest of its era, and notable for its Renaissance-era baroque architecture. Dr. Bloodorange meant for the hotel to spark the tourism trade in Abdera. The structure was beset by problems almost from the very beginning. In 1958, only five years after the grand opening, the hotel burned to the ground. Bloodorange vowed to rebuild the Independent bigger and better. And he did. The gala opening of the new Independent Hotel in 1961 was one of most celebrated events in Abdera history. The tourism trade never caught on in Abdera, and since Dr. Bloodorange’s death in 1971 the Independent Hotel has passed through numerous owners, and for a few years in the early 1990s sat empty. In the mid-1990s the city council nearly purchased the hotel to destroy it. A last-second intervention by New Moon Properties to buy the hotel and restore it gave the Independent a new lease on life. Currently the Independent Hotel is half permanent residents, half hotel, and the first floor has been renovated to allow for a dozen small shops to serve the Shoreside neighborhood. Some claim they can still hear the ghostly screams of those who died in 1958 fire. I was wondering what that building was! It’s amazing the things you can learn if you just keep your eyes open.